It's easy to use. Put the tracker in your pocket or bra and just do your thing. You can then check your results directly on the Fitbit or on your phone/computer. Trust me if you get one you will constantly be checking it! It encourages you to add extra steps to your regular day. At Target yesterday, I parked further away than I normally would. After taking out the compost, I walked a lap around the yard. The little things add up to lots of extra steps! It tracks your sleep and determines if you are restless or awake during the night. I find this particularly interesting given my sleepwalking habits. I'll see sometimes that I was awake for several minutes during the night at a time. Wonder what I was doing?! The kids are in to it. They have started asking me how many steps I've done so far each day. They're also quick to comment if they think my number is too low! It has a silent alarm. You wear the tracker to bed on your wrist in a little bracelet type thing that it comes with. When the alarm goes off it sends you silent vibrations that wake you but not anyone else. This comes in super handy for boot camp mornings when I don't want the rest of the house up at 4:45am! Some other cool things about Fitbit are that you can link up with other friends who use Fitbit to help encourage each other. Fitbit also links up with several other apps (like My Fitness Pal) so you can transfer the data between the two. Not too shabby, eh? 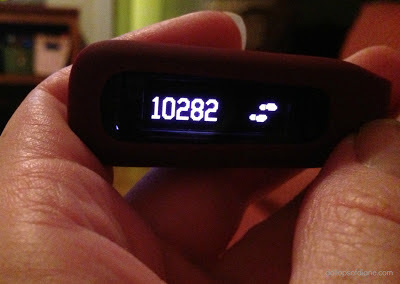 The Fitbit One runs for around $100 so it's not cheap but I am really enjoying it. You can head on over to Amazon HERE and purchase one of your very own. Once you do, come back and tell me if you've become obsessed with it, too! 10,000 steps a day is my goal!